Congrats on your fantastic sports bar and pub near Globe Life Park in Arlington, Texas! 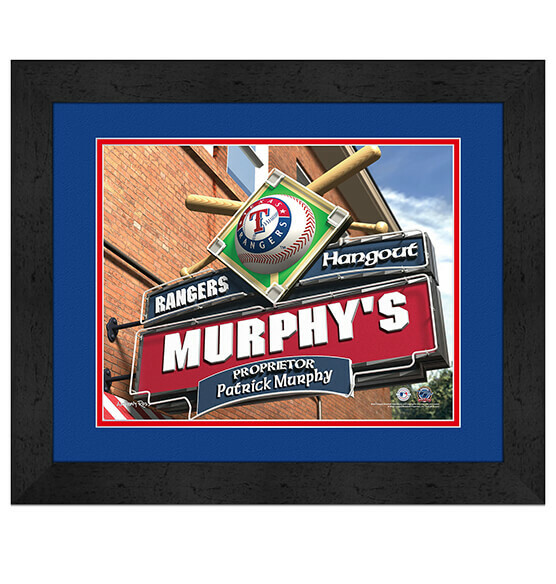 With this Texas Rangers Personalized MLB Pub Sign Framed Print decor, your fellow Power Rangers fans will be green with envy. Easily customize this generously sized, ready-to-hang piece with the name or nickname you want added to the marquee. Your name will look great there along with the baseball bat, ball and diamond accents. With its team colors, team logo and crisply printed details, this Texas Rangers sports decor is sure to look fantastic hanging in your home or office.